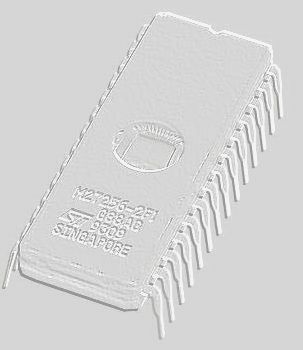 This programmer can programming all standard 8 bit EPROMs in range from 2716 (2 KByte, 24 pin) up to 278001 (1 MByte, 32 pin). It uses standard and cheap chips, most expensive part is Textool socket. Of course it's not indispensable using especially this type of socket. Eprprgst.zip - software for Atari ST with source. 74HC574 - 2 ; CD 4555 -1 . Total 12 IC-s.
Transistor : NPN - 6 ; PNP -11 . You may put on this positions practically any low power silicon transistor, only polarity is important. Characteristics should be about: max. current: 100mA or more, max. voltage: 30V or more. Examples: NPN: BC237, BC548, BC337. PNP: BC307, BC558, BC327 etc. LED : 2 piece . Diode : 1N4148 - 11 ; Germanium or schottky -2 . Zener diode : 3V - 4 ; 6V8 -1 ; 14V -1 ; 22V -1 ; 26V -1 ; 33V -2 .